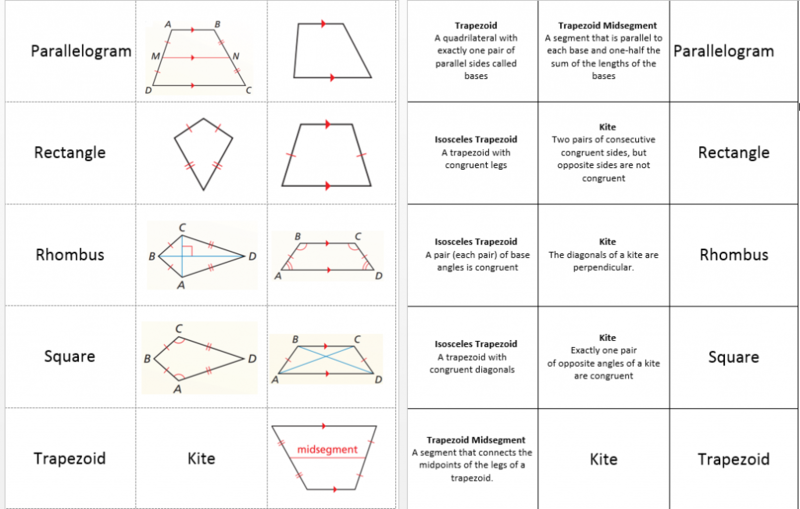 There is a lot to keep straight when it comes to quadrilaterals and their properties. I’ve decided to have my students take notes over the properties by making flash cards. Once they have learned all the properties, I plan to have them review the unit with the game board below. 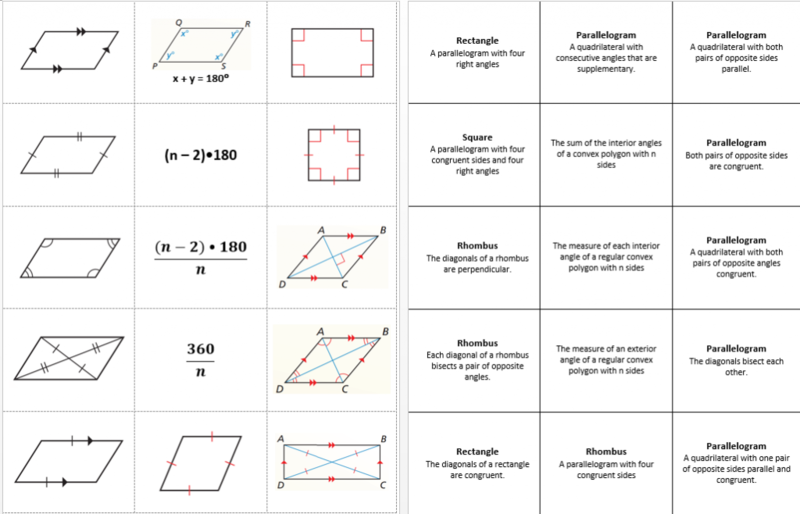 My idea is to have them partner up and one student goes first, picking a square to answer. They both work it out. If the first student gets it right, he/she puts a flash card that justifies their reasoning on that square. If that student is wrong, the second student can “steal” the square if their answer is right. The key is provided in case arbitration is needed. Then the second student picks a square and they both work to answer the question. The winner is the first to 4 in a row. Blackout can be played if there’s time. 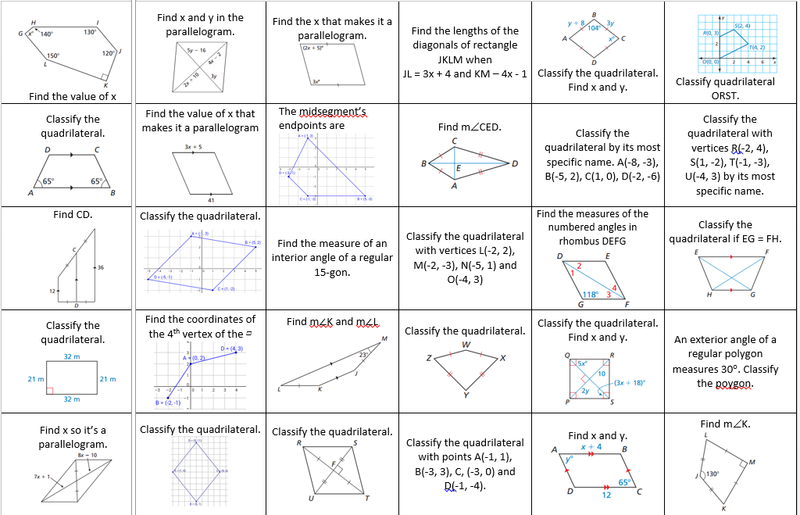 Properties of Quadrilaterals Review Game – print this on 11″ x 17″ paper. You will get a warning that the margins are small, but you should be able to bypass the warning and print anyway. It saves paper and time if you don’t have to have students cut margins off their flash cards. The key to the game board and possible cards they could play as justification is on page 2 of the review game file. If you use this in class, please let me know what you think. The Quadrilaterals review game is awesome. I’m so glad you like it. I just wish I had bigger desks in my classroom.